Please make sure you try to unpack some of your boxes of clothes. Get your spring cleaning bug earlier this year since you have the time off. Half of my clothes. I still have to unpack more boxes filled with clothes. I know you attempted to organize what was already there, so give yourself a pat on the back! Also, make sure to keep your scrap supplies in order to the best of your ability! That way, when you want to use something specific you’ll always know where to find it (NOT! That never works, haha). Moreover, I know your scrap room is in progress, so don’t worry too much that things look slightly hectic! It’s definitely getting there. I still need to organize by brand. I still need to put more shelves up on the wall. Don’t forget to reorganize the pictures and little knick knacks on the hallway shelves. If you find any time today, try to make a new 6×6 layout for the shelf. If not, don’t fret over it. Just do it when you can. I need to move these pictures around. Also, remember to write down the ingredients you used the other night to make sushi. It was fun eating homemade Futomaki and other scrumptious rolls. Working on a California roll. Lately, I've had sushi cravings. Remember to call Jennie and tell her that you have fallen in love with a new snack brought home to you from Malaysia called, kuih kapit, also known as love letters because of the intricate patterns on each cookie. It’s folded up because it’s a “love letter”. Oh, and don’t forget to thank Gloria for educating you on what these snacks are! I love looking at the patterns! So pretty! More detailed view of the cookie. Make sure to share that layout you completed yesterday for Scrapmojo. You thought it was a funny challenge to give yourself a superhero name, so you went ahead with it. Last but not least, don’t forget to blog about how excited you are for the end of March! Share the fun news about how your ticket to Maui has been booked. You are definitely in need of a real vacation! I am so excited for this trip. Good job on cleaning up your closet. Woo! A reference to Malaysian Chinese! haha. Isn’t kuih kapit delicious?! It’s one of the few reasons why I wished we didn’t move when I was 5. (I miss my birth home 😦 ) Sometimes I dream of ordering enough kuih kapit to last me a lifetime. Yay to my mom for bringing me back 4 tins so I could share some with you. Now don’t eat it all without me! Anyway, I love the LO. I’m waiting for me. See you in a few hours! It looks like your house is coming along nicely! I wish that my closet looked as clean as yours. I’m also loving your latest layout. I wish, I wish, I wish. I’m glad at least yours is getting organized 🙂 Love your layout. The circles look great!! Holy crap! The closet is CLEAN!! Stark difference from your closet back at lars and rox’s place (or lack thereof). I totally want to go to Hawaii! LUCKY! 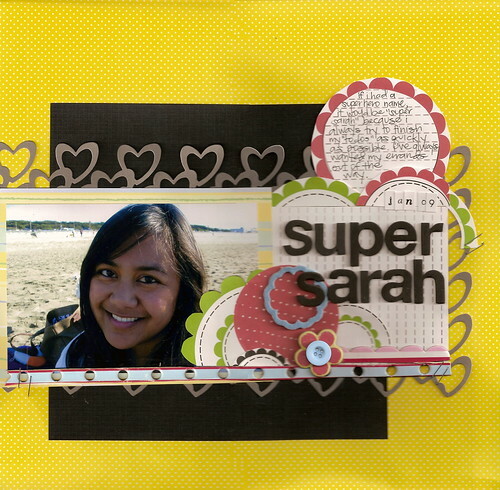 Great job cleaning, everything looks great – you totally are “Super Sarah”! I agree with Melissa… you are definitely super sarah ! Have fun in Hawaii ! BTW I have tagged you ! See my blog ! Hey, I color coordinate my clothes too. Drives my family crazy, but it just makes me happy we I see it. Anyway, cute LO and Maui…so exciting! Have a wonderful time and take lots of pics to share with all of us!! Lovely layouts and cards! So cute! I LOOOVVVEEEE california roll!! How cool that you made your own!! I should look into it too. I could eat it everyday!! ay! ang galing naman ng ginawa niyo! paturo nga kung pupwede? hehe. palagay ko parang kimbap ang lasa ng futomaki na iyan. uuuy sobrang sarap naman tingnan! and those cookies look scrumptious! what do they taste like? are they like thin fortune cookies, or more like the european-style wafers? Ooohhh! Trip to Maui!!! That sounds fab gal!! Yes, I love your Super Sarah LO! You are indeed supa! You are totally adorable! Loved reading through your blog. Thanks so much for playing along with us. Super cute take on the challenge.